If you worry about your dog while you are away at work, or you just want your furry best friend to have a day of fun, exercise, and attention, our dog daycare is just what your dog needs. Dog Daycare at Hill Country Pet Ranch in Boerne, TX is a very fun and stimulating experience for dogs. We at the Hill Country Pet Ranch believe in quality dog daycare. Our measure of success is a tired healthy dog who participated in structured social sessions including mentally stimulating games, fun activities, dog play and rest periods. We tailor your dog’s day with us based on your dog’s needs and wants. That day may include group off-leash dog play or individual playtimes. Our off-leash playgroups, comprised of a small number of dog buddies of similar size and play style, are focused on fun and the well-being of your dog. Providing a safe, positive social play experience for your pet is our priority. For the less social dog, we offer one-on-one playtimes with one of our pet care professionals devoted to doing just what your dog wants to do. Have your dog stay with us for Dog Daycare! We proudly took the Play Safety Pledge! At the Hill Country Pet Ranch we've taken a safety pledge. We proudly commit that our daycare for dogs program has been designed for the safety and pleasure of your pet. We strive to ensure the physical safety of each dog and our goal is for every dog to go home from our center behaviorally and emotionally better than when they arrived. 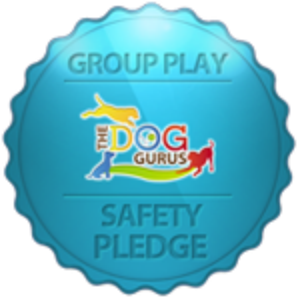 By visiting The Dog Gurus website, www.thedoggurus.com, you can view our pledge, take the Off Leash Play Pet Owner safety pledge, as well as, learn how you can keep your dog safe during play. Copyright © 2019 Hill Country Pet Ranch.